People love wine, and they especially love talking about it on social media. They reach out to friends and followers to see if anyone is interested in opening a bottle that evening. They post pictures, quotes, and memes about wine’s superiority over work. They even share the latest in “wine innovations,” including the wine glass that can’t spill, and the device that turns a wine bottle into a single massive glass. However, for such a strong wine consumer presence on social media, wineries are surprisingly absent. 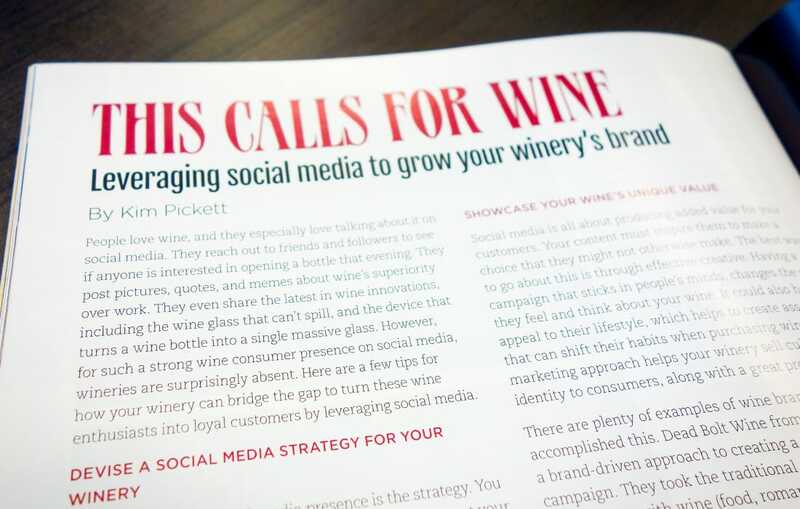 Here are a few tips for how your winery can bridge the gap to turn these wine enthusiasts into loyal customers, by leveraging social media. The backbone of a social media presence is the strategy. You need to establish a plan in order to accurately represent your brand on social media. Since there are so many advertisers on each social platform, it is crucial to carve out a niche to help you stand out. Luckily, wine is such a diversified good that it is easy to find things about your wine or winery to highlight. Once you know what you want your social media presence to showcase, it’s time to strategize an approach for each social channel. A tailored approach is necessary because the demographics on each platform are unique. Facebook’s average North American user is 40.5 years old, and the user base covers the widest range of ages, with the highest percentage of 55+ users of any platform. Over 90% of Instagram’s users are under the age of 35, while 41% of millionaires use LinkedIn. Understanding these nuances, and tweaking your social content for each platform, is a must. It’s one of the best ways to capitalize on the power of social media to reach customers, and create brand loyalty in your target market. Social media is all about producing added value for your customers. Your content must inspire them to make a choice that they might not otherwise make. The best way to go about this is through effective creative. 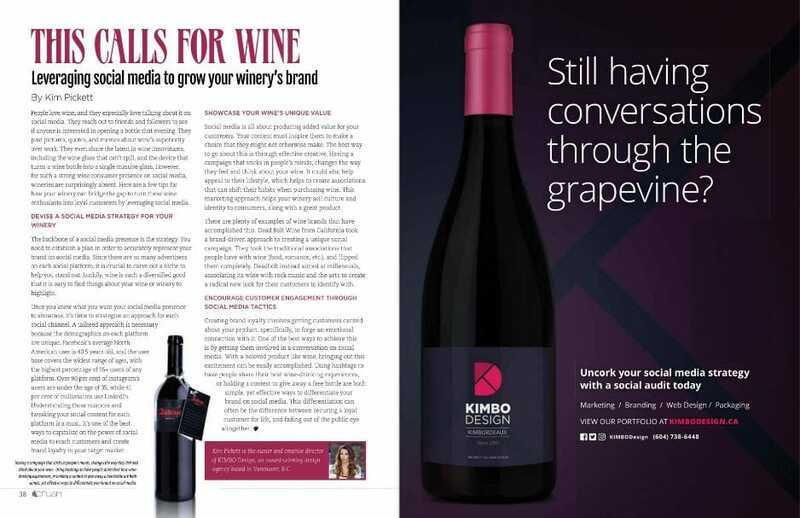 Having a campaign that sticks in people’s minds, changes the way they feel and think about your wine, or appeals to their lifestyle, helps to create associations that can shift their habits when purchasing wine. This marketing approach helps your winery sell culture and identity to consumers, along with a great product. There are plenty of examples of wine brands that have accomplished this. Dead Bolt Wine, from California, took a brand-driven approach to creating a unique social campaign. They took the traditional associations that people have with wine (food, romance, etc. ), and flipped them completely. Deadbolt instead aimed at millennials, associating its wine with rock music, and the arts, to create a radical new look for their customers to identify with. Creating brand loyalty involves getting customers excited about your product specifically, to forge an emotional connection with it. One of the best ways to achieve this is by getting them involved in a conversation on social media. With a beloved product like wine, bringing out this excitement can be easily accomplished. Using hashtags to have people share their best wine-drinking experiences, or holding a contest to give away a free bottle are both simple yet effective ways to differentiate your brand on social media. This differentiation can often be the difference between securing a loyal customer for life, and fading out of the public eye altogether.